Based on the Dutch novel of the same name by Herman Koch, director/writer Oren Moverman's THE DINNER serves up a hearty portion of boredom and unpleasantness. 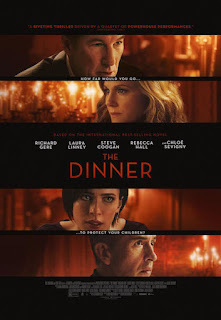 The plot revolves around two couples – politician Stan Lohman (Richard Gere) and his wife Kate (Rebecca Hall), and history teacher (and brother of Stan) Paul Lohman (Steve Coogan) and his wife Claire (Laura Linney). They have all come together for a meal at a fancy restaurant in order to discuss how to best deal with a shocking crime committed by their sons – Paul and Claire's son Michael (Charlie Plummer) and Stan's son Rick (Seamus Davey-Fitzpatrick), by his ex-wife Barbara (Chloe Sevigny). Stan also has a black adopted son, Beau (Miles J. Harvey), who wasn't involved in the crime but plays a part in what happens after. While the couples talk, or at least attempt to, Stan is also trying to wrangle enough votes to pass a piece of health care legislation, his assistant Nina (Adepero Oduye) keeping him abreast of that situation. The restaurant staff, notably server Dylan (Michael Chernus), do their best to deal with the general chaos caused by this tense family meal. Basically, this is a movie that asks you to spend two hours with a group of unlikeable, amoral, and uninteresting characters as they argue over how to deal with the crisis. We also get several mostly pointless digressions into the family's past. With a cast like this, you know they're going to act the hell out of the movie, and they do. Unfortunately these characters are little more than stock, and the moral dilemma the movie spins around is never dealt with in any real depth. What exactly the movie is trying to say about anything is unclear beyond the fact that these are all horrible, self-centered people, and it's really no surprise that their kids wound up going down a bad path. It all leads up to a wholly unsatisfying anticlimax. 2 out of 4 stars. Amazing fun fact: this is based on a best-selling Dutch novel that, in its short publication history, has already been filmed twice before. I saw the 2014 Italian version, which had the good sense to largely throw out most of the uncinematic plot and be its own thing. Thanks for the heads-up. Life is too short for boring movies.